Class 2 - Deimos board is a certified Class 2 Rhomb.io motherboard that allows the creation of electronic devices using exclusively standard Rhomb.io modules. 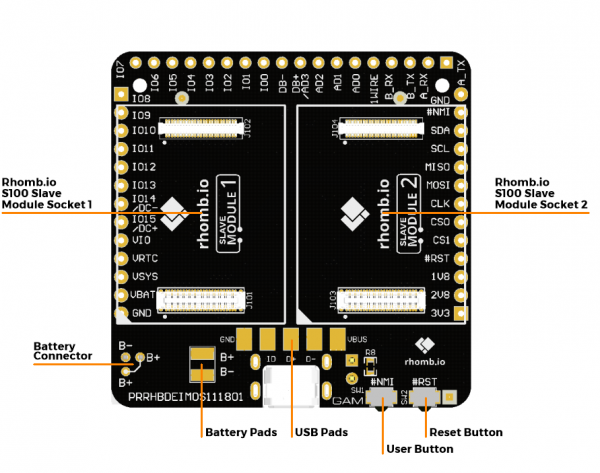 It combines the ease-of-use of Rhomb.io modules with a reduced form factor, and it has been developed for the Internet of Things (IoT) bearing in mind fast product development. The board also includes a battery management circuit bringing the designer the capacity to make portable devices. The next figures show a 3D view for the Class 2 - Deimos. 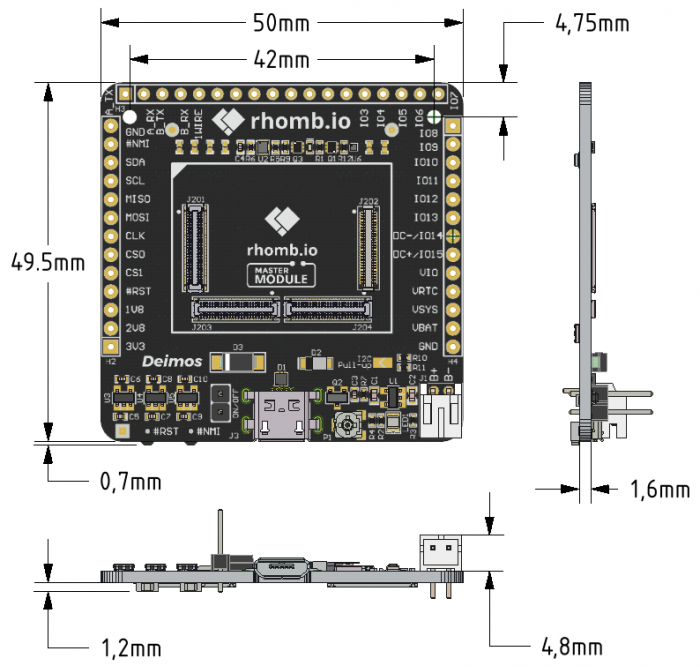 Class 2 - Deimos board has been designed for working only with standard Rhomb.io Master modules. 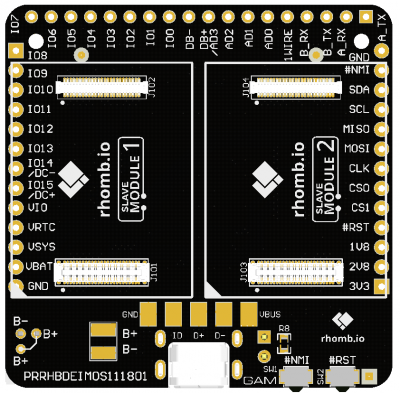 Three Rhomb.io module sockets are available, one for the Master module and two for the Slaves modules. That brings simplicity and speed up the product designing and development stage. There are two different ways to empower the system: using the micro-USB connector or a battery. The board also includes a lithium battery charge management controller bringing the capacity to work independently of the power supply. Three low-dropout regulators (LDO) provide the board with all necessary voltages for the operation of any Rhomb.io plugged on any socket. Look at the "Power" section to find more information. 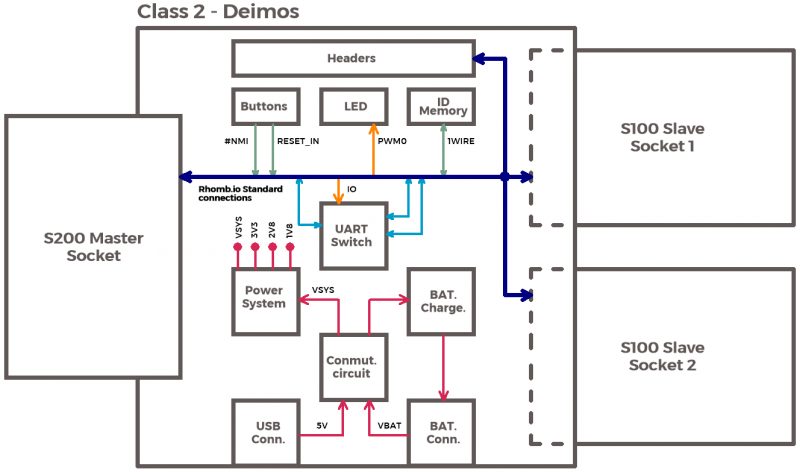 Class 2 - Deimos board includes an UART switch to allow you to control with a Master with at least two UART interfaces all the possible UART interfaces of the Slaves modules independently of the sockect position. The switching is done by activating the "IO26" signal from the Master module. The following image shows how connections are made. The following figure identify the main parts of the board. There is available one micro USB 2.0 port on the Class 2 - Deimos board and it works as a host for the Master module. It is also three headers with a total of 44 pins that allow to access to some Rhomb.io Master Module signals. The following table shows the pinout of the headers. Note that pin 9 of the header H3 can be connected to AD3 signal of the Master module and to DIFF-B_P signal from the Slave module of Socket 1 using solder-jumpers. By default, AD3 line is the connected line, with SJ1 closed and SJ2 opened (invert this configuration to use the DIFF-B_P signal). In the same way, pins 7 and 8 of the header H4 can be connected to IO14 and IO15 from the Master module and to DIFF-C_N and DIFF-C_P from the Slave module of the Socket 2. By default, IO lines are connected with SJ4 y SJ6 closed and SJ5 y SJ7 closed.the closed ones (invert this configuration to use the DIFF-C signals). 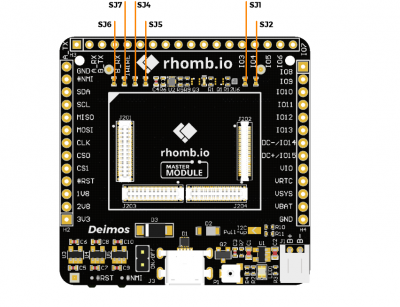 Class 2 - Deimos board has no integrated wireless interfaces, but you can use communication Rhomb.io modules. 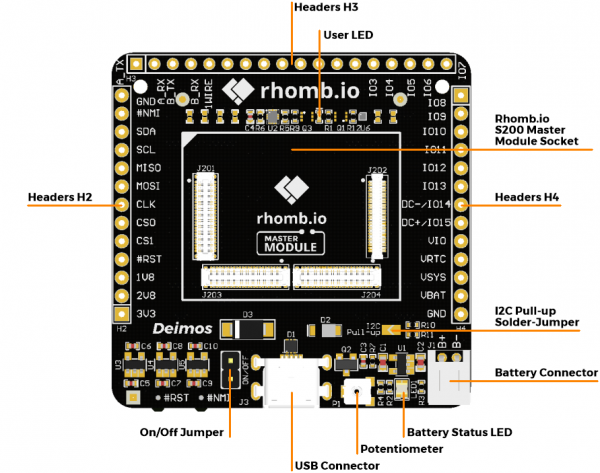 Class 2 - Deimos board has no integrated memories, but you can use storage Rhomb.io modules. 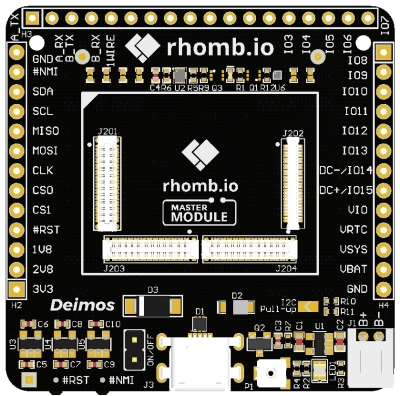 Class 2 - Deimos board has no integrated audio or video interfaces, but you can use video/audio Rhomb.io modules. Battery status LED: Formed by two LED, one yellow and one green. The yellow one turns on when the battery is being charging and turns off when the battery is fully charged. The green one turns on when the battery is fully charged. User LED: Programmable LED controlled by the PWM0 signal of the Master module. The "Reset button" is used to reset the microcontroller of the Master module. The "User button" is connected to #NMI signal of the Master module and can be programmed as you want. The following table summarizes the standard signals of the Rhomb.io Master module socket and where they are used in the Class 2 - Deimos board. These signals may have no functionality depending of the microcontroller plugged on the board. Functions with "HX.YY" estructure indicate designator HX and pin number YY. "I2C-A" signals are pulled-up to VIO from the Master through 4K7 resistors. Those pull-ups are defined as normally connected to the supply. If you want to disconnect the supply, there is a solder jumper next to the pull-up resistors (SJ3). 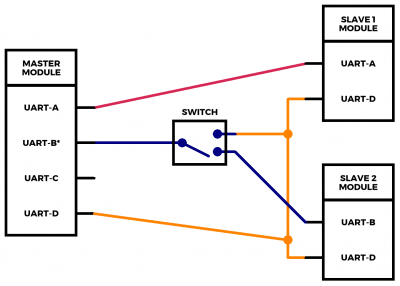 "#NMI" signal and "#RESET_IN" signal are usually pulled-up on the modules. In Class 2 - Deimos board are tied to GND when the buttons are pushed. The "on/off" header allows you to turn off the system by open the jumper while the battery is still charging. If you want to use this function, be sure the R8 resistor (located next to the header, on the bottom side) is disassembled. This page was last modified on 25 February 2019, at 07:44.